Dan is a freelance illustrator based in Northampton (UK). For high quality original caricature / cartoon drawings and paintings, professional illustrations and creative web graphics and logos please contant Daniel Jeffery. Dan works in a variety of media from traditional pencil, pen, paint to digitally created artwork. He has an adaptable style depending on your requirements. If you would like to commission him then please feel free to get in contact. A caricature/cartoon picture is a great original gift idea for someone's birthday, anniversary, special occasion etc. If you have an idea in mind or want to talk to Dan about what's possible please feel free to get in contact. Cartoons are a great way of engaging your audience and explaining your message. This can be anything from a health and safety poster to explaining how APR works (and everything in between). Contact Dan with your requirements. Professional digital illustrations can really help show your client what the final product or idea will look like. Dan can create realistic digital illustrations for any project, be it big or small. Contact Dan with your requirements. Professional graphics for websites. 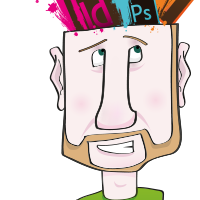 This can be anything from info graphics, logo designs, cartoon illustrations or complete website design layouts. Contact Dan with your requirements. Dan’s never too far away from a pencil, which is good because he loves to draw. Whatever you have in mind- from funny, original caricature/cartoon drawings, cartoon sketches or paintings, high quality illustrations, professional artwork for your website, please contact Dan. He works in a variety of media from traditional pencil and paint to computer and he has an adaptable style. Whatever the project, be it a piece of bespoke artwork for someone’s birthday to a series of cartoon style health and safety posters, you can be sure that Dan puts 100% arty goodness and creativity into all of his drawings and artwork. If you would like to commission Dan then please get in touch with your requirements.